Day in and day out, we desire to instill character in our children. Day in and day out, it’s a challenge that is worth it. I reflected on my time in the kitchen this past week, and realized that the hidden life lessons found together cooking are often those that just happen – unintentional, unprompted, unplanned, and unrehearsed. We started baking our muffins, but then ended with my eldest daughter whipping up some of her yummy cheesy noodles for lunch. They were both a hit, but it really wasn’t about learning to cook in the kitchen, it was about what happened in between all those moments captured in the pictures. We learned that too often sharing doesn’t come naturally, but when we practice it, joy flourishes. We learned that attitudes are a choice. We all have that choice…but what we decide to focus on is our own. We learned that often, paying attention to the small details in life are necessary to avoid disaster, but sometimes, it’s all about flexibility. It’s knowing when to implement each effectively where the lesson is learned. We learned that instant gratification isn’t long lasting, but practicing patience while waiting for that special moment to come is where true character is honed. The hidden life lessons that come from spending time in the kitchen is priceless. The work is worth the hidden rewards. Have you learned any life lessons in the kitchen lately? Welcome to Tasty Tuesday Parade of Foods! Also, please link back here from your post, so that everyone can join in the fun – it’s just common courtesy of blog carnivals. Yesterday I decided to give the kids a day off school- spur of the moment. It was a great decision that runs counter to my schedule crazy personality. I need to go with my gut more often when it comes to my kids. I would have less “what ifs” and more memories! Beautiful post Jen. 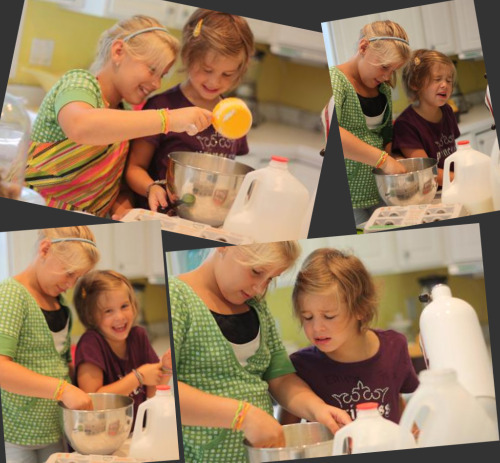 I think sometimes I, being a perfectionist, learn more when I cook with my girls then they do……. when I bake/cook with them, I have to remind myself to be patient, let them learn, let them do it “their way”. The hidden life lessons that come from spending time in the kitchen is priceless…you couldn’t be more right! My husband and I discovered the joy of cooking together, and it is now one of our favorite things to do. I don’t know what it is, but preparing a meal together is a very bonding experience. You get to talk about your day, spend precious time with one another, and then eat the fruits of your labor. What a blessing : ) God is SO good! Hope you are having a blessed week so far, friend. The lessons and the memories are priceless! Lessons in the kitchen? How about courage and creativity! I want my children to have courage to try new things and be creative in the kitchen! Maybe I should add – being careful. After 2 hard afternoons of canning I took a short cut and ended up with a burn on my leg from boiling water. 🙁 You’re never too old for a lesson! Excellent post! I think that any time spent one on one with your children is an opportunity to teach and to learn, the kitchen is certainly no exception. The kitchen they can learn math, science, problem solving, creativity, plus just being reminded of all the gifts of food that God gave us. I never let an opportunity pass where I can’t teach and remind about God. Thanks! I don’t know who is learning more in the kitchen as my kids are beginning to want to help. My kids are learning how to cook and I am learning to be more patient. That is a huge life lesson for any parent and it is one that I need a lot of help with. I really needed to read this this morning. I have a busy day in the kitchen planned (by myself) and I can choose to be joyful about it. Choose to be thankful I get to be at home cooking instead of going to a job that I don’t want to go to! I needed a little attitude adjustment and this did it! What a lovely, lovely post Jen – Those lessons are so very true and important. Thanks for sharing it, and also for hosting Tasty Tuesday. Lovely pictures. I think one lesson I’ve learned in the kitchen is balance. A little pinch of salt in the cookie dough adds balance. I little drop of honey in the vinaigrette balances the vinegar. Lots of little touches that balance out the flavors. So it is in life a small kind gesture towards someone who has experienced rudeness can help add balance. A smile can add balance to a sad moment. And on and on. Thanks for another great party…so many yummy things to check out…”chocolate gravy” isn’t that hot fudge? Better check it out! Jen, you have single-handedly revitalized my menu planning! (For that, my husband especially thanks you.) 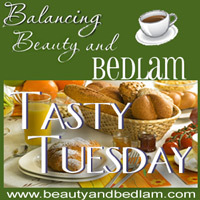 Thanks for Tasty Tuesday—and for your fantastic blog! What a resource! That’s so true. It’s so much about the impromtu moments. Thank you for sharing. Great lessons and great pics! Adding my “Make Your Own: Flavor Extracts” post. Details how to make your own vanilla, mint, and other extracts in time for upcoming holiday baking. 🙂 First time here! WOW!!! Excited to see so many tasty looking recipes!